With a focus on continued improvement and progress, team owner Al Heinke and his Heinke-Baldwin Racing team unveiled the faces and names of their 2016 driver lineup on Monday. The team, which has in the past fielded cars driven by Todd Burley, Alan Johnson, Erick Rudolph and four-time Super DIRTcar Series champion Matt Sheppard, looks to combine energy and experience for the upcoming racing season. 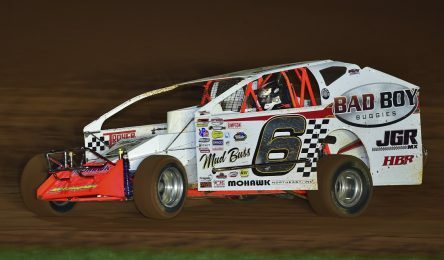 The reigning champions of the Super DIRTcar Series will field four drivers across three cars as they add the “Buckeye Bullet” Dave Blaney, “Mini Magic Shoes” Max McLaughlin and the “Thunder From Down Under” Peter Britten for 2016. Former NASCAR XFINITY Series driver Mike McLaughlin will also join the squad, leading the No. 6H team as crew chief for son Max. The team’s returning driver, Jimmy Phelps, is looking forward to sharing space with his new teammates, as he sees the tremendous benefits of sharing insight and perspective amongst all the members of the newly expanded team. Blaney and Britten will split the 2016 SDS races in the 18H, with new dad Peter finding himself closer to home as he races at Canandaigua Motorsports Park on Saturday nights. Blaney will work around his World of Outlaws Sprint schedule to join HBR for a select number of SDS races, his participation adding new excitement to the Series. When Blaney is racing, Britten will move to the crew chief position for him — working alongside fellow crew chief Kurt Wiegel as well as Phelps in the 98H. Britten’s mechanical skills will be well utilized as his driving role expands even further at HBR. Max McLaughlin, who impressed many at the Charlotte World Finals last fall with the “Pole Position Raceway Fast Time Award,” joins HBR with his Hall of Famer dad Mike as his Crew Chief. Max will run the Super Dirt Series and find himself wowing the crowds at Brewerton on Friday nights with teammate Phelps. Dave Blaney will take the wheel of the 18H for an estimated 10 SDS races. His level headed, disciplined racing style will add yet another interesting facet to the new HBR line up. Blaney exhibits a tenacity that enables him to get everything possible out of whatever he is driving, and he commands performance not only from himself, but from those around him. His 35 years in racing, which includes consistent high performance in the NASCAR Sprint Cup Series and a championship with the World of Outlaws Craftsman Sprint Car Series, positions him as an invaluable source of knowledge for HBR.